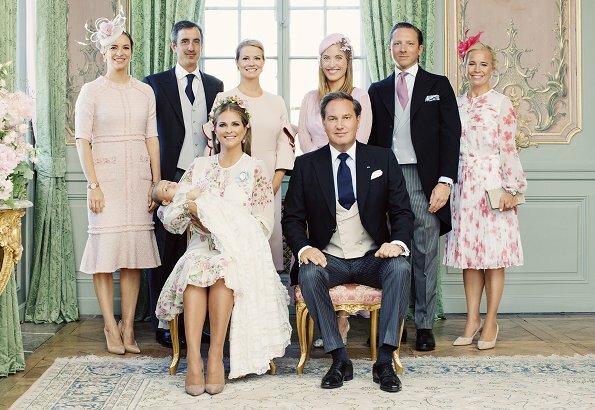 On June 8, Friday, Princess Adrienne was baptised by Archbishop Antje Jackelén at Stockholm Drottningholm Palace Chapel. Today, on June 11, official baptism photos of Princess Adrienne were published at the royal website. 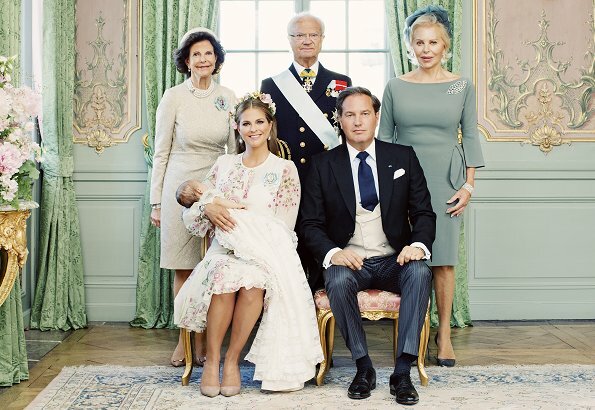 The photos were taken by photographer Erika Gerdemark at Drottningholm Palace. These official photos are family photos showing Princess Adrienne's family members and godparents together. Too bad no pictures of the family of 5. Yes, it's strange. May be this pic. hasn't been shared. Wonder if the lady in green is Christopher O'Neill's mother...She looks very nice. Her dress is simple and elegant with just the waist tie, brooch and wrist cuff...classy! Wonder no more. That is his mother Eva and yes she is dressed perfectly. Yes, this is Eve O'Neill, Chris's mother. This is indeed very lovely and elegant look. Love that brooch. His mother really looks elegant. Beautiful pictures! Although I miss the photo that is always taken with the siblings. I wonder why it was left out when both Chris' and Madeleine's siblings were there. A pity the two other children of the family do not appear on the photos. P. Madeleine is GORGEOUS!! The ceremony was very pretty and I absolutely love watching P. Leonore!! The Photos are very nice everyone looks happy,sadly no picture with parents and all the children on it. Maybe Leonore would not have sit still so the left them off. Still very nice.